A French court has postponed the trial of a Norwegian neo-Nazi musician after his lawyer requested more time to read documents and prepare his defence. 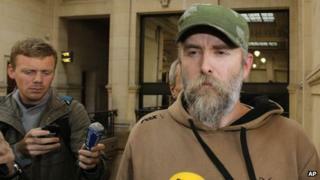 Kristian "Varg" Vikernes will now face trial in June 2014 on charges of inciting racial hatred and glorifying war crimes. The Norwegian was accused of planning a terrorist act after his wife, a licensed gun holder, bought weapons. French authorities later conceded there was no plot and the two were released. Mr Vikernes holds neo-Nazi views and was one of those sent a copy of the manifesto of his compatriot Anders Breivik, the far-right militant who killed 77 people in attacks in Norway in 2011. In May 1994 Mr Vikernes received a prison sentence for murdering the guitarist of a rival black metal band and setting fire to churches in Norway. After his release in 2009 he moved to France with his wife and children. French authorities placed him under surveillance. On 16 July they arrested the couple in the southern region of Correze after the wife began buying shotguns. July 2013: Arrested on "suspicion he was preparing a major terrorist act"
Officials later said she had a valid firearms permit and released the pair. Mr Vikernes has vowed to sue the French authorities for arresting him with "no good reason" and "in the most brutal way possible". He says officials have not returned his firearms or his ceremonial weaponry, including his swords, spears, and helmets. Since coming to France, Mr Vikernes has continued releasing music and writing. He will be tried on incitement charges related to postings on his blog which prosecutors say were "anti-Semitic and xenophobic". Through his writings he promotes what he calls "Odalism", an ideology based on the idea that White Europeans should re-adopt "native European values".